In recent days we have seen a number of high-profile art law suits, both criminal and defensive. Yale University filed for a defensive law suit, to secure its ownership of the star painting in its Yale Art Gallery, the iconic "Night Cafe" by Van Gogh (1888). There have been many headline-grabbing lawsuits brought by grandchildren of the victims of Nazi or Stalinist seizure of artworks, who have filed to have works restored to them, plucked out of museums and private collections. (The dramatic story of the restitution of Malevich paintings will be featured in the first issue of ARCA's Journal of Art Crime). Now we begin to see storied institutions donning legal battle armor in anticipation of a potential lawsuit. The issue at Yale is with Pierre Konowaloff, the great-grandson of wealthy aristocrat Ivan Morozov, who owned Van Gogh's painting in 1918. The Russian government nationalized and appropriated Morozov's property during the Communist revolution--including the painting, which was later sold by the Soviet government. "Night Cafe" has been hanging in the Yale Art Gallery for more than five decades. In 2008, Konowaloff's attorney asserted his client's ownership title to the painting, and Konowaloff has publicly stated that he wants the title of the painting transferred to the Russian nation, and that he wants to receive financial compensation. Yale declared that it wishes to "remove any cloud over its ownership," pre-empting a suit on the part of Konowaloff to reclaim the painting. Between an art theft from Yale's Slifka Center linked to a drug and arms dealer, a lawsuit from the descendants of Geronimo to reclaim the skull of the warrior chief that they claim was looted by members of the secret society Skull & Bones and is being used in the society for rituals, and this recent furor over "Night Cafe," Yale has provided a petri dish for the study of art crime over the past two months alone. Three stolen works of art were recovered, along with nearly 40 other stolen paintings, firearms, heroin, marijuana, and cash, in a New Haven home. The three artworks, two paintings and a drawing, had recently been stolen from Yale University's Slifka Center, taken on two different days from an exhibition inside. The recovery is important both to highlight the nature of most art crimes worldwide (which involve lesser-known works of art than the headline-grabbing heists most people expect), and the link between art crime and the drug and arms trades. Even with a relatively small-time crook, such as the local New Haven heroin dealer who had stolen art, guns, and drugs in his home, the connection between art theft and "more serious" crimes is evident. Czech police: Impressive 3 month turnaround from heist to recovery. Dutch police recover 8 paintings, including Pissarro and Renoir, 22 years after the heist. An interview with Myles Connor. While we’re at it, here’s the official UNESCO 1970 Illicit Cultural Property document. Charlotte Observer: ICE finds stolen Italian bust in Charlotte. Marine Colonel Matthew Bogdanos talks about recovering items in the Iraq National Museum. Edward Dolnick's The Forger's Spell is an impeccably researched and entertaining account of the "most successful art forger of the twentieth century (xiii)." In depicting the forgery career of Han Van Meegeren, the book covers a variety of topics from the Dutch experience during World War II and the art collecting practices of Hitler and Goering to the role of connoisseurs and wealthy collectors in the art market. In this respect, Dolnick's work serves as a reference guide for those interested in pursuing further research down the many avenues of art crime. Although his work is by no means groundbreaking, it does highlight the critical conditions necessary for the "natural disaster" that resulted in the forger's being able to capitalize on the art establishment's foolhardiness (292). Here we find that the forger's skill in selling a fake product rests as much on his ability to paint as on his identification of the perfect mark. We read how Van Meegeren's marketing of each forgery induced a first impression in experts that instantly removed any doubts in authenticity and therefore any need for scientific testing as well. Unfortunately, at times The Forger's Spell is as verbose and repetitive as any Victorian novel. It only overcomes these soporific effects when detailing the clever processes through which Van Meegeren produced his infamous Vermeer's. Never would I have thought that mixing Bakelite with lapis lazuli would yield a blue similar to the one made famous by Vermeer's brushwork. Additionally, I would have never have known that for the thirty six paintings attributed to Vermeer there have been nearly as many misattributed to him by art experts. As Dolnick discusses, these misidentified paintings have caused the ruination of countless careers and reputations. Dolnick's intention is not to expose the fallibility of these so-called art experts and historians, but rather to simplify how we experience art by removing any prejudices and by viewing objects with a blank slate. In the words of former Met director Thomas Hoving, the idea is to "be dumb let it [the art] do the talking (242)." In this regard, The Forger's Spell succeeds because it inspires one to appreciate "art for art's sake" and to judge art for his/herself. ARCA Trustee Anthony Amore, Security Director of the Isabella Stewart Gardner Museum, just appeared in a New York Times feature article. You can see Mr Amore in action in an upcoming episode of "America's Most Wanted" which will feature the unsolved Gardner theft. We salute Mr Amore and his outstanding efforts, both as a security director and in his investigation of the Gardner theft. An extensive interview with Mr Amore will appear in the upcoming book, Art & Crime, the first book published under the auspices of ARCA (published by Praeger this coming June 30). Friend of ARCA Ulrich Boser appears in the same article. An interview with Mr Boser appears in this blog. Mr Amore and Mr Boser appeared along with ARCA Director Noah Charney on a National Public Radio broadcast about the Gardner theft, which may be accessed below. We salute our colleagues, and will include further updates on the Gardner case as they become available. A razorblade left on a library floor. That was the slip-up that led to his arrest. Over 8 years, he had sliced out at least one-hundred rare maps from the world’s greatest libraries. But this is not the tale of Cesar Gomez Rivero, the thief of Spain’s National Library maps. Nor is it the story of Ben Johnson, the student intern who stole and mutilated scores of important historical letters while working at Yale’s Beinecke Library. This is the story of the American Edward Forbes Smiley III, convicted in May of 2007. He, along with Gomez Rivero and Johnson, are just a few thieves among thousands worldwide who profit from the theft of rare maps, books, and manuscripts. Map theft is frighteningly commonplace. But discreet statistics are rarely if ever kept by police, so the exact number of book, manuscript, and map thefts per year in various countries is unclear. In the US alone, there are certainly the thousands per year. It is safe to say that there are tens of thousands each year worldwide, the map thefts alone worth tens of millions of euros. The Gomez Rivero case made international headlines, and shook Spain’s infrastructure to the point of politicians and cultural ministers resigning in disgrace, for their failure to protect the treasures in Spain’s National Library. For much of the world, the exposure of Gomez Rivero was a shock—how could this criminal mastermind steal such valuable works from a prominent national institution. But for those in the know, the greatest surprise around the Gomez Rivero case is not that someone was stealing from a national library, but that someone was actually caught. Gomez Rivero, who admited to the theft of nineteen maps, eleven of which have been recovered, is a small-time crook, compared to a master thief like Smiley. Mr Smiley used Xacto knife blades and wet string to silently dismember rare maps all over the world. He altered the edges to hide his cuts and bleached out ownership stamps, before selling the maps to international collectors and dealers. Among the libraries he victimized are the New York Public Library (eleven maps stolen), the Boston Public Library (thirty-four stolen), Yale University Library (twenty), Harvard University Library (eight), the Newberry Library in Chicago (two), and the British Library (one). And how many stolen works are still out there, which he has not admitted to? The Boston Public Library alone reported thirty-three more maps discovered missing from books which Smiley had consulted in their archives. The libraries of Yale University have been frequently victimized, and provide a microcosmic example indicative of the huge global problem. In 1973 a pair of priests were charged with the theft of rare books from Yale and other university libraries around the United States. They would conceal rare books under their priestly vestments. The FBI raided their headquarters at the Saint Stephen’s Monastery in Queens, New York, and found hundreds of stolen books. 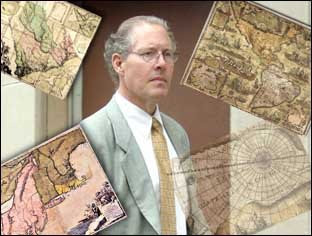 In 1979 Andrew Antippas, a visiting professor from Tulane University, pleaded guilty to having stolen five rare maps from one of Yale’s libraries. In 1981 an antique microscope, built in 1734 and valued at $10,000 (€7000), was stolen from Yale, only to be recovered in a trash can. In 1997, a man called John Ray stole a valuable 19th century art book. And in 2001, 21-year-old summer intern Ben Johnson stole fifty items valued over $2 million (€1.2 million) from Yale’s rare books library, the Beinecke. Keep in mind that these instances are from Yale libraries only, and are only those which were discovered. Certainly countless more have occurred that have not been detected, at Yale, in Madrid, and at libraries worldwide. As Spain’s Foreign Ministry admitted, at least 300 “highly valued” objects have disappeared from the National Library in recent years. A Ministry spokesman said that “already back in 1859 the odd disappearance of a book has been noticed” and yet security remained lax. Map collecting has its own qualities, distinct from art or book collecting. Unlike rare books, maps have a display appeal. But unlike most art, maps do not require specialized knowledge to discuss. Much of the pleasure of collecting is not only in the conspicuous display, but in a conspicuous didacticism. To own an object of high value about which you can point out details which are invisible to first-time viewers shows off one’s worldliness. Map collecting appeals to the wealthy dilleton who wants to appear knowledgeable, but does not necessarily have the background training. Just as Spaniards should not think that map theft is a rare occurrence and has happened only to them, they should take some cold comfort in knowing that poor library security is an international handicap. McDade concludes, “the library thefts in Madrid, far from being unique, actually follow a standard practice. A researcher is given access to these things, he knows exactly how to avoid the meager security, he knows exactly what he wants, and no one is ever the wiser.” The surprise is not in the National Library thefts having occurred at all, but that someone was careless enough to have been caught. The importance of studying the history of art crime is the ability to learn from past mistakes and take measures to prevent it in the future. Edward Forbes Smiley III, Ben Johnson, and Cesar Gomez Rivero offer us many lessons in how to protect maps in our libraries. Researchers, even those known to librarians, should be treated with polite suspicion. Glass-topped work tables should be used so that nothing can be concealed beneath them. Work spaces should be open on the sides, not hemmed in by privacy walls. Video cameras should record steadily the workspace for researchers. Digital images should be catalogued of all maps in a library’s collection, to facilitate identification and tracing. Books should be flipped through at regular intervals, to insure that all of the valuable pages are in place. Staff should occasionally sit with researchers while they work. Rare items should never mix with items from the library’s general collections, to prevent concealment or swapping. Laptops and bags must be opened on entry and departure, always. To defend against insider thefts, better screening of employees is needed, including regular evaluations, monitoring, and exit interviews upon the termination of employment. There are hundreds of Smileys and Johnsons and Gomez Riveros still out there, plundering one of the least protected of the world’s treasure troves. But we can learn from past thieves how to defend against those in the future. ARCA is pleased to announce the winners of its new annual awards. Each year ARCA will award individuals for their outstanding efforts for the protection and recovery of cultural heritage, and the study of art crime. Awards are voted on by ARCA’s Trustees and the Editorial Board for The Journal of Art Crime. ARCA honors these individuals for their exemplary work. ARCA offers a summer internship on location in Amelia, Italy (between Rome and Orvieto) during the Postgraduate Program that we run, from June 1-August 26. Applicants must be proficient in Italian. The work schedule is 25-30 hours per week. Duties include administration, research for our various projects, and aiding students, faculty, and the Dean during the program. Housing in Amelia for the summer and a meal allowance will be provided by ARCA. This presents an excellent opportunity for professional work training in the broad and interdisciplinary field of cultural property protection and work against art crime, while spending a lovely summer in Italy. If you are interested, please thoroughly acquaint yourself with the information about our Program on our website, and contact noah.charney@yale.edu . The focus of this international conference is the academic and professional study of art crime, and how the study of it can help contemporary law enforcement and art protection. ARCA seeks to encourage scholars and students worldwide to turn their attentions to the understudied field of art crime and cultural property protection. The more minds working in the field, and the better the relationship between scholars and professionals (from police to security to the art world), the better protected art will be in the future. ARCA welcomes submissions of papers for presentation at the conference. Papers should be 20 minutes in length, and should be related to the academic study of art crime or the collaboration between scholars and professionals for the prevention of art crime. ARCA Members may attend the conference free of charge. A small attendance fee, in the form of a tax-deductible donation to ARCA, is required of attendees who are neither members nor presenters. Tickets may be reserved by email, with limited numbers available. A complete schedule with further information on the conference, keynote speakers, and beautiful Amelia, Italy, will be available on our website. The conference will include presentation of the 2009 ARCA Awards, and a keynote speech from Col. Giovanni Pastore of the Carabinieri Division for the Protection of Cultural Heritage. Please send submissions, ticket requests, and inquiries to conference@artcrime.info . In July 2008, ARCA director, Noah Charney delivered a lecture at Cambridge University which discussed the 1961 art theft of Goya's "Portrait of the Duke of Wellington," 1812-14. The theft grabbed headlines for the unusual ransom demands made for the return of the painting. The stolen Goya was even referenced in pop culture when it was shown hanging on a wall in the 1962 James Bond film Dr. No. As Charney discusses, the trial that ensued after the painting's recovery helped to reshape and redefine "theft" under British common law. The podcast can be found here or by clicking this post's title as well. The State Department investigates confiscation and sale by Fidel Castro of a work by Spanish Impressionist Joaquin Sorrolla. Tome Raiders: Rare book theft is sadly often easy to carry out, especially in smaller libraries and places such as monasteries. In a twist on the usual international cultural property spat, can plaintiffs collect damages from a county in the form of confiscating and selling cultural property? Read about a long-running case against Iran by victims of a suicide bombing. In ARCA's first podcast, director Noah Charney, takes us on a journey through the criminal underworld of the 19th century and beyond. Beginning with the sale of the portrait of Georgiana Spencer, the Duchess of Devonshire (portrayed by Keira Knightley in the 2008 film The Duchess) by Thomas Gainsborough, 1787, and introducing an intriguing cast of characters from a robber baron to the first private eye to even the man whom many consider to be the most successful criminal of all time, this podcast is not to be missed! Download the podcast here.